Eighteen months ago, when I was applying for funds to conduct research in Bolivia, one of the criticisms I had to respond to was this: How do you know that mass protest events will be going on while you’re there? In the end, I resorted to putting a table of recent events of large-scale space-claiming protests in my two focus cities in my proposal to make this point: there has not been a 12-month period without such protests since last century. On the day after Christmas, the Vice President (then acting president since Bolivian law requires that the office must always be filled by someone physically in the country) announced that the Bolivian government would remove all subsidies on fuel: primarily gasoline and diesel, and let the prices float to international levels. Fuel prices went up 70-80% overnight. This was not the first time that such a drastic move has happened in Bolivia, but it was the first time that the popular movement-linked MAS government had taken the step. In fact, the MAS had led major protests against exactly the same move less than a decade ago. The politics of subsidies in general and the gasolinazo in particular are fascinating, and fully getting the arguments requires putting aside everything that Westerners are taught about prices, markets, and subsidies, but that’s a whole other post (several pages of which are in my notebook waiting to be typed into an article). In any case, the social movements that brought the MAS to power, including Evo Morales’ coca grower base, did not hesitate to mobilize against the gasolinazo. (And the transport sector quickly moved to double fares.) Despite some pressure on their leadership, the Neighborhood Councils, Factor Workers, labor confederation, and others mobilized mass protests. The scene in El Alto in particular, especially on December 29 and 30, brought back collective memories of the mobilizations that toppled presidents in 2003 and 2005, even though the numbers were not yet as great. Evo and Álvaro reversed course, and returned fuel prices to their former levels. However, the price hike genie was out of the bottle. While some in the government promised the gasolinazo was over, others have made it clear that the prices will be raised in smaller doses over the coming year. Several weekends in January and February, there has been panic buying in La Paz over rumors of an imminent price hike. More pressingly, this year’s extremely late rainy season (normally beginning around November 1, it didn’t really kick in until the New Year) and other factors have led to a national sugar shortage, grain price hikes, and a squeeze on the milk producing industry. The national government’s response was first to use its agricultural production support company, Emapa, to supply sugar directly at low prices to the cities, in an attempt to push the price down. However, Emapa itself abruptly raised prices in late January, and the government has been embarrassed by former ministers and senators illegally wholesaling government sugar out of their homes. Finally this month, the transport sector has moved to increase urban transit fares in a half dozen cities, and began charging the new fares without official approval. The economic situation has brought multiple sectors into the streets, although without unified demands. Buyers and sellers of the same product are both mobilizing. Ideologies conflict as well: some are demanding the enforcement of the free-market principals of Supreme Decree 21060, while more are calling for it to be revoked. Shopkeepers demand that Emapa be abolished, while neighborhood councils in Oruro demand that it distribute basic goods directly to neighborhood suppliers. And in Cochabamba, drivers demanding higher fares and factory workers and neighborhood council marchers who oppose them have each attacked the property of the other side. On February 18, the national worker confederation known as the COB (Bolivian Worker’s Central) carried out a 24-hour strike. And when Bolivians strike, they march. That included a 10,000+ worker march down the main highway from El Alto to La Paz. The COB is demanding either wages or wage increases in line with a study it performed on the cost of basic goods in the country. However, this analysis showed that the baseline cost of living is 8,300 Bolivianos per month for a family, about $1200. This is above and beyond the typical Bolivian’s earnings, leading the government to disqualify the study as anything more than a pipe dream for workers. A second march on the 18th, led by the more radical teachers’ unions of La Paz department brought an harsher indictment of the Evo Morales-led government. Placards, chants and speakers labelled the government “incapable” and committed to neoliberal policies like the gasolinazo. Once again the slogans of seven years ago rang in streets, and a working-class crowd was calling for the indigenous peasant union leader who is president to resign and make way for “a government born of struggle in the streets.” Such a government, radical unionists claim, could guarantee larger wage increases for workers by expropriating transnational corporations in extractive industries and redistributing their wealth to enlarge workers’ salaries. 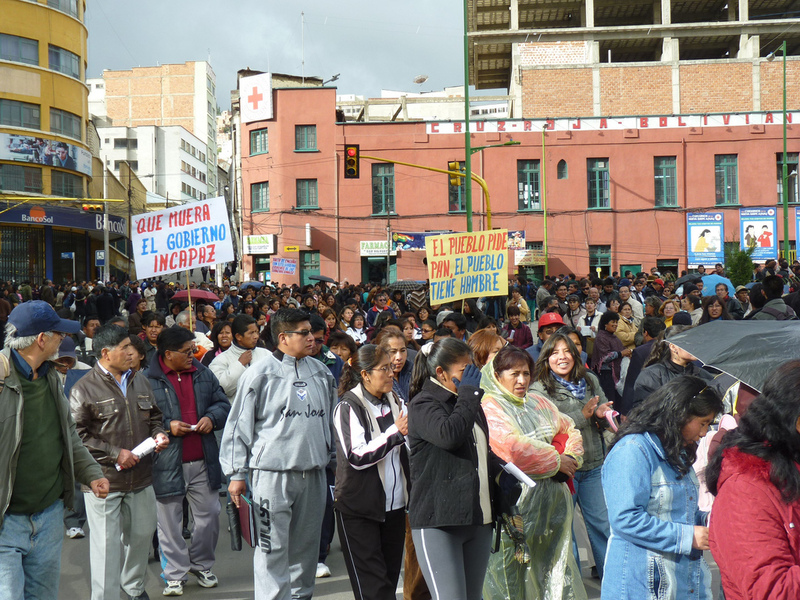 Health care workers and teachers rally in La Paz, February 18: Signs read "Death to the incapable government" and "The people ask for bread; the people are hungry"
It is not so much that this rhetoric is new as that it has migrated from the pamphlets of the radicals at sides of the march to the main stage. Like a stopped clock that is right twice a day, those who are always skeptical that the government has sold out the public, and turned against the grassroots are now in sync with at least a large portion of the popular mood. And they can speak to broadly shared concerns about the cost of living, the subcontracting of work, and the lack of sufficient investment in the industries that provide employment and public revenues to Bolivia. Five years of MAS rule, and two years since its decisive victory over right-wing resistance to the project of a new, plurinational constitution have allowed a lot of tensions, mistrusts, and frustrations to accumulate within the party’s diverse grassroots base. Movements that always knew how to mobilize on their own have frequently been in the streets in the past years. Unfortunately, the first response of the MAS government has often been to accuse those who mobilize of being aligned with, misled by, or even “infiltrated” by the right-wing opposition. If anything, it now seems that independent protest and even independent opposition has been made more likely by these accusations.